Homeowners vs Rentals Net Worth | Maple & Main Realty , MA, and in this part of the country, the financial benefits of owning vs. renting arguably weigh in favor of buying. Loan interest rates are still low (in the 4% range, depending on the product) - so it is a great time to be a home buyer. Of course, it is a personal choice. Some people prefer not to have the responsibility of home ownership. For me, purchasing our first home was a wonderful milestone - and lead me to my current career. I happened upon this interesting tidbit on the NAR (National Association of Realtors) blog this morning - and wanted to share it. 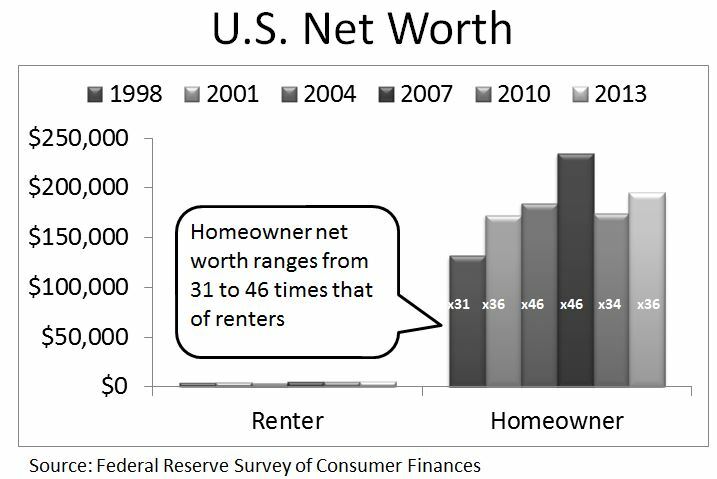 Posted in Economic Updates, In the past 15 years, the net worth of the typical homeowner has ranged between 31 and 46 times that of the net worth of the typical renter.Homeowner equity is a substantial component of homeowner wealth. The Federal Reserve's Survey of Consumer Finances, conducted once every three years, provides a snapshot of family income and net worth along with basic demographic details and more detailed information on where families keep the wealth they have accumulated.The most recent survey, conducted in 2013, offers a picture of the situation as home and equity prices normalized for most household balance sheets.Data shows that median homeowners had nearly $200,000 in net worth or 36 times that of the median renter who had just over $5,000. The median value of owners' homes was $170,000.Many households own a primary residence 65.2 percent. It is the most commonly held non-financial assets after vehicles 86.3 percent. posted by Danielle Hale, Director of Housing Statistics on September 8, 2014 via Net Worth of Homeowners vs. Renters.